Today, the Bay Area’s CHURCHES released their debut, self-titled EP. The six tracks hit hard, pumping out at a palatable mixture of 90s-influenced indie rock. The project was produced by current WATERS and former Port O’Brien front man Van Pierszalowski. Pierszalowski’s influence is understated, but CHURCHES shares the energetic, guitar-driven sensibility that served as the cornerstone of WATERS’ debut Out in the Light. Hoosier native Pat Spurgeon sets the beat for CHURCHES, rounding out their sound with cymbal-heavy percussion. Spurgeon gained national attention a few years back during his public struggle to find a living organ donor for his failing kidney. At the time, Spurgeon was holding down rhythm for the band Rogue Wave, forced to perform grueling dialysis treatments amidst a busy tour schedule. The experience was chronicled in the award-winning documentary D tour. Spurgeon’s story has placed him in the spotlight in the national debate over health care reform. Staying insured is often a struggle for full-time musicians with inconsistent paychecks. However, this is not a post about Pat. This is a post about a new band that is worth your attention. I am particularly taken with tracks “SAVE ME”, “FEEL ALRIGHT” and the drum-driven “HUSK.” CHURCHES relies heavily on early grunge and alternative influences, but the soaring vocals lead singer Caleb Nichols prevents the project from dissolving into the darkness that dominated that scene. 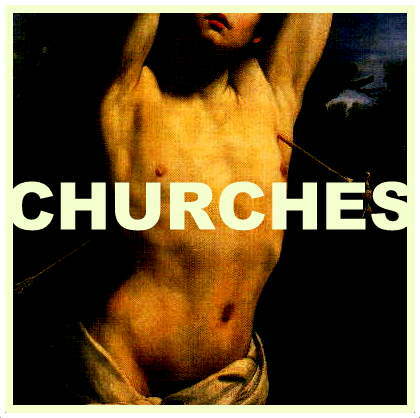 Stream the entirety of CHURCHES’ self-titled EP below. Name your price for a download via Bandcamp. West coast readers can catch the band live at one of the tour dates listed below.